I was recently in San Francisco for a couple of days where I accidentally stumbled across an exhibition of M. K. Brown on display at the Cartoon Arts Museum. I had never heard of Brown before, and at first glance, I wasn’t sure if I would like her work; the style was a bit loose and exaggerated for my typical taste – but I was quickly won over. For starters, her sense of humour is hysterical – attacking quotidian life through absurd juxtapositions and philosophical epiphanies that estimable artists of comedy seem to exploit so easily (such as Bill Hicks, Monty Python, Dylan Moran, etc.). By way of example, check out Single’s Bar and some other examples on Rugged Claws. And the more I viewed the work, the more I liked her style, and found it well matched for the subject matter. She relies primarily on traditional pencil/ink/watercolour techniques, and I must say that seeing them in person was really valuable; the bits of pencil, tape and white-out seemed to ground the work and substantiate the time, care and passion put into making each panel. I’m kicking myself now for not picking up the catalog, but thankfully I see it is still available on Amazon. In 2013 I was lucky enough to stumble across Aida Makoto’s exhibition, Monument for Nothing, at the Mori Art Museum in Tokyo. I had never heard of Makoto before this, but I was an instant fan; I lingered in the museum for several hours checking out his impressive array of works. Greeting the audience at the entrance was a massive paper lantern titled Heart. This work evoked much more than simply taking a quotidian object out of familiar scale. It was actually remarkable in how the sculpture did not feel like a hyperbolic stunt; contrary to its size, the glowing light and combination of bamboo, paper and wash of paint presented a very soft, meditative work. Jumping ahead to a few rooms was a work of a completely different nature and attitude. Harakiri School Girls was like a Quentin Tarantino film crystallized into a single image, but actually more raw and brutal, because even in Tarantino films there is an immediate appeal for the audience to invest in a kind of moral ante before dealing out the cards of the plot. But in this painting, the girls are cute, innocent, and self-defiled: no evil villain to loathe and cheer for his fall, only a complete break with what is not only pure, but also sane. And despite this, there is a kind of aesthetic attraction enveloping the scene in the rendering and color of the picture – which just adds to the unsettling nature of the composition. Unlike Heart, this is not a meditative work. Thus is the nature of Makoto’s creative brilliance well captured in this solo exhibition. Each work lurched from being a provocative vulgarity, to a meditative pool of stillness, to some that were strangely both in one, as with the giant panoramic painting Ash Colored Mountains. From a distance we see the calm stillness of foggy rolling hills, yet upon closer view the thousands of dead bodies forming them emerge, while a detailed inspection reveals the fine detail of each figure. I was also greatly impressed by the range of media in the exhibit: video installation, performance art, new and old traditions of painting, collage and manga illustration were included in this panoply. Makoto’s hands are certainly not afraid to go where his mind wanders. 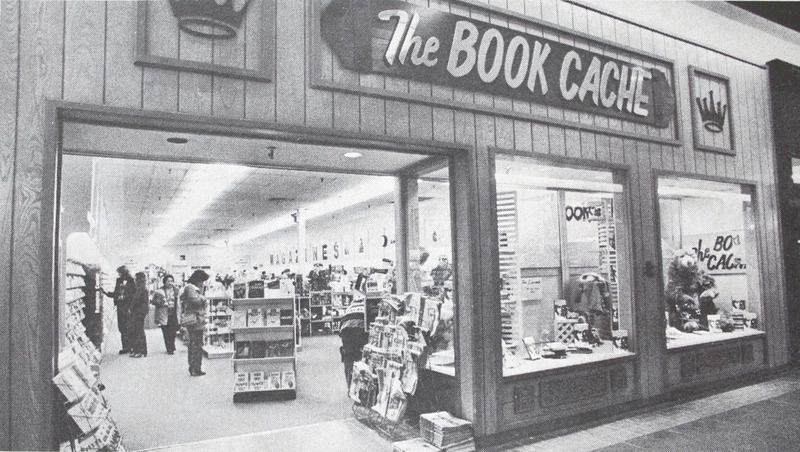 Growing up in the Alaska in the 80’s I would walk a few blocks to Boniface mall, where the nearest Book Cache was located, and thumb through their meagre comic book offerings. Behind the standing rotating rack, where Richie Rich, Spiderman, The Fantastic Four, and Sergeant Rock lived, on the curious shelves near the gentleman’s magazines, the glowing psychedelic covers of Heavy Metal magazine arrested my attention. But I was too young (and not tall enough!) to peruse or procure them in the shop. Luckily my older brother could, and as he and his friends collected every issue. When they weren’t home or too busy with a Dungeons and Dragons campaign, I would sneak soundlessly into their lair and vanish into the captivating Sci-Fi/Fantasy worlds of Heavy Metal; it was an experience that can only be described as opium for the eyes for a 12 year old boy. It wasn’t just the sexually charged scenes – it was the whole universe it offered, and I quickly appreciated the more intelligent and (sometimes) philosophically probing content. I literally dropped my appreciation for DC/Marvel after spending about 30 minutes with my first Heavy Metal issue. It wasn’t until much later that I learned that Jean Giraud was a strategically pivotal figure, not just in co-founding this magazine (as Métal hurlant in France) but also for breaking open the barriers for the content and type of artistry that can be explored in graphic novels/comics today. 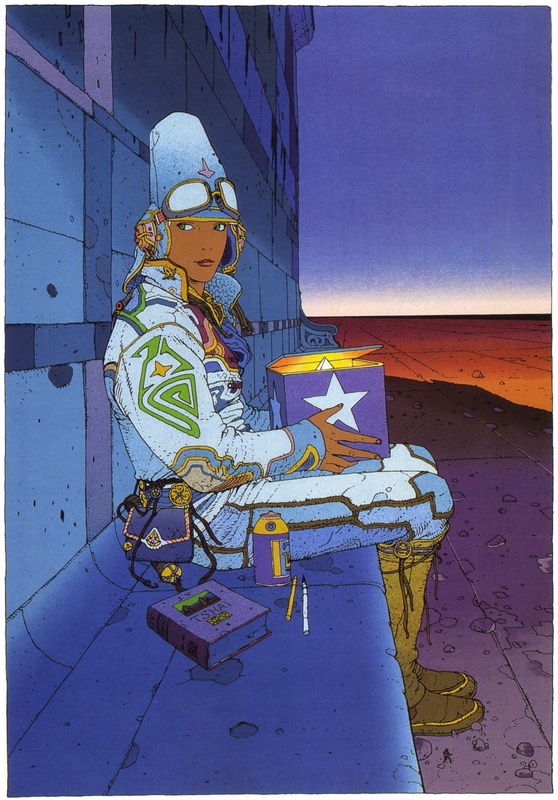 There are plenty of resources online where one can easily find images of Jean Giraud’s various masterpieces. In fact, there are a number of great summaries of his work, such as this Aphelis website I only just discovered, as well as this article by Andy Khouri on the Comics Alliance, pointing out that some of Giraud’s work has become so iconic that they have become touchstones for artists to riff their own creative takes from the composition. If there was a single image I would have guessed this phenomenon to have occurred, it would be with this Starwatcher illustration. As soon as I started looking at his work online, and buying up some of his books (Blueberry, Arzach, The Incal), I was amazed at how pervasive his style emanates. 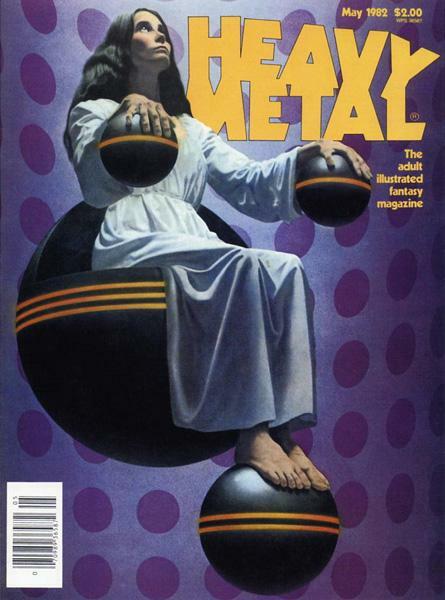 I know that several great artists worked on Heavy Metal, but images such as the Starwatcher locates precisely my emotional and historical relationship to that publication (and era) – probably even more so than a Blue Oyster Cult song (and that is saying something). Beyond Jean Giraud’s artistry with the figure, color, space, or composition, what I have come to be most impressed by is his efficiency. His drawings and illustrations capture precisely what is needed – no more and no less. This is something I constantly struggle with, and I always return to Giraud for inspiration.